But I didn't find in these some of my favorites tools, which I use on a daily basis, and I think that's because these are OSX/Terminal intended tools, not fitting well in above questions. OSX Intended: brew is, git is not! Easy Install: one liner, ie. git clone; wget ... etc. Do you know any other similar must-have tools? I would love to discover new ones! Please only include one utility per answer. Also, please don't add duplicates. Check first before posting. If you see a duplicate, kindly downvote the answer and inform the author by leaving a comment. The missing package manager for OS X. It is an amazing package manager, very light and easy to use. KIS Principle, that makes me think of archlinux. Its community is big and very active. See also brew tap command which provides some missing formulas that can be useful like when you need latest php version > brew tap josegonzalez/php. Great for searching text files, you'll never have to use a find/grep combination again. 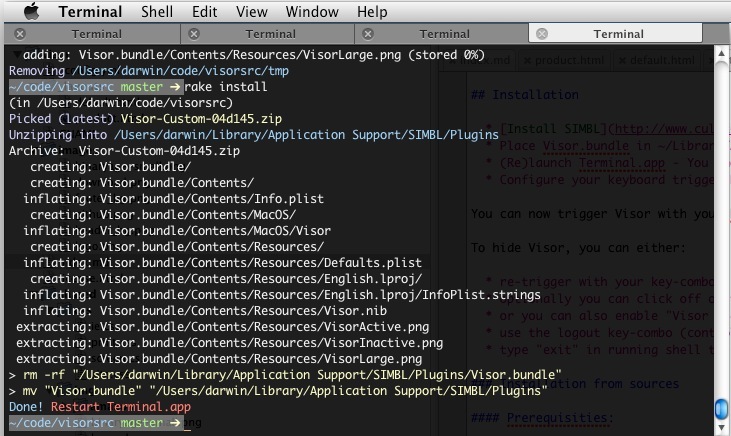 Made me love shell when I was just using it when I had to... Zsh is "bash on steroids", with oh-my-zsh and all its plugins, many specifics to OSX, shell is a lot more user friendly and powerful... Oh also themes are pretty cool. I can't live without this. One command to update them all. local brew="brew update; brew upgrade;"
local gisty="gisty pull_all; gisty sync_delete"
local pip="pip freeze --local | grep -v '^\-e' | cut -d = -f 1  | xargs pip install -U -q"
Obviously you can add more commands according to the package managers you use. This is made by me. cdf to open the Finder directory in the terminal and open . to open in Finder the directory terminal directory. [[ -n $colored ]] && echo "$colored" || echo "$out"
This can be quite slow since it needs to parse the entire file before printing it. Never use this on a binary file! pip install Pygments to install pygments. This is a slight modification of the original Inconsolata. It is a fantastic monospaced font for use with Terminal.app, TextMate, MacVim and anywhere else you need one. A must have for any coder. Tabs, visor, hotkeys, very simple and reliable. Well maintained with frequent updates. Download OS X binary. Also online. Great command line utility that stores cd commands and automatically creates an autocomplete shortcut to your most accessed directories. Even better, if several directories have a similar name (starting with the same characters), Autojump will simply pick the one you most commonly go to. You won't have to type the whole name. j p will now take you straight to the full project1 path. Now what if you create a similar folder called project2 which you also access often (but less than project1), Autojump will assign a lesser weight to project2 and take you straight to project1. If you hit TAB after typing "pro" for instance, your shell will display project__, hinting at the fact that there are more than 1 matching directory. Another TAB hit will display the list of matching directories and allow you to select the one you mean. Note: I've recently installed ZSH and noted some interference due to the autocomplete features. Autojump works perfectly on a vanilla Terminal. 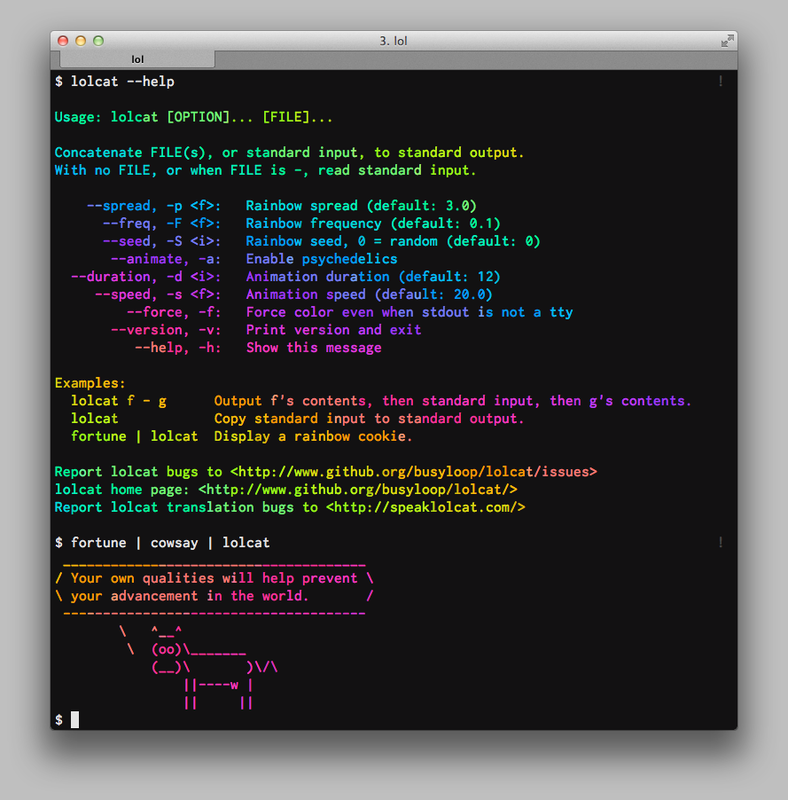 Lion supports ANSI colors so hack-y things like SIMBL are no longer required. For Snow Leopard and earlier, you'll need SIMBL installed to make the most of it since color support in Terminal.app is limited. The MacPorts Project is an open-source community initiative to design an easy-to-use system for compiling, installing, and upgrading either command-line, X11 or Aqua based open-source software on the Mac OS X operating system. A code-searching tool similar to ack, but faster. A friendly wrapper for launchctl. Start your agents and go to lunch! bro pages are a highly readable supplement to man pages. Bro pages show concise, common-case examples for Unix commands. 14 entries for find -- submit your own example with "bro add find"
# Executes a command on the files and folders matching a given pattern, in this case, output the last lines of each .foo file in the current folder and subfolders. Boxen - Automated Mac OS configuration and build, install/update software. It helps saving a lot of time when you want exactly the same setup, (software, version) in the development team and also allow each individual to install other tools to increase productivity. Quite cool. It drops down a terminal on the press of a key-combination. An alternative to oh-my-zsh (see above). A really useful collection of scripts, aliases and functions for bash. Also provides a nice plugin system for adding your own additions. Not a terminal utility, but a utility for using Terminal. It puts a button in the Finder toolbar and when pressed it creates a new Terminal window cd'ed to that directory. edit: The developers are saying that the version of the app available directly from them has more features than the version on the App Store. I've updated the link to go to their page, but the App Store version is still available here. Not technically a terminal command but very handy for quick manpage lookups by allowing url of: "man:ls" to show html page of the manpage in your browser. -e "s/Tests run: \([^,]*\), Failures: \([^,]*\), Errors: \([^,]*\), Skipped: \([^,]*\)/[32mTests run: \1[m, Failures: [01;31m\2[m, Errors: [01;31m\3[m, Skipped: [01;33m\4[m/g"
Not the answer you're looking for? Browse other questions tagged macos mac terminal utilities . Which OS X Applications do you find indispensable? What are your “must-have” MacPorts? Free utilities for a power users switching from Windows to OS X? 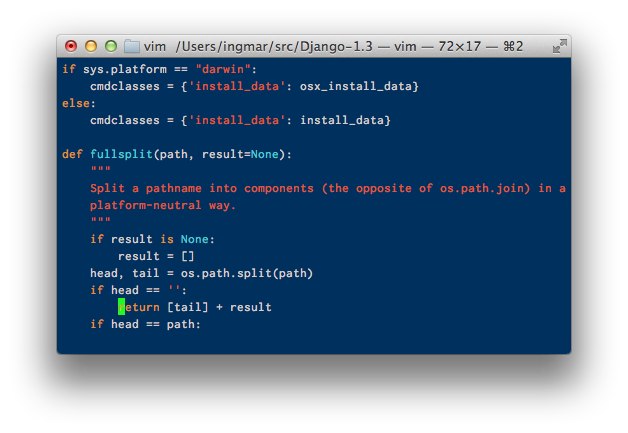 How to merge files after using split command from terminal? How to replace Mac OS X utilities with GNU core utilities? Why does the folder icon in my Terminal have a question mark overlaid? Can't enter utilities when rebooting?